An illustration depicting antibiotic resistant bacteria which possess the New Delhi Metallo-beta-lactamase-1 (NDM-1) enzyme. NDM-1 belongs to a group of beta-lactamase enzymes called carbapenemases, which allows bacteria to deactivate carbapenem antibiotics that are usually prescribed as a last resort when treating serious bacterial infections. 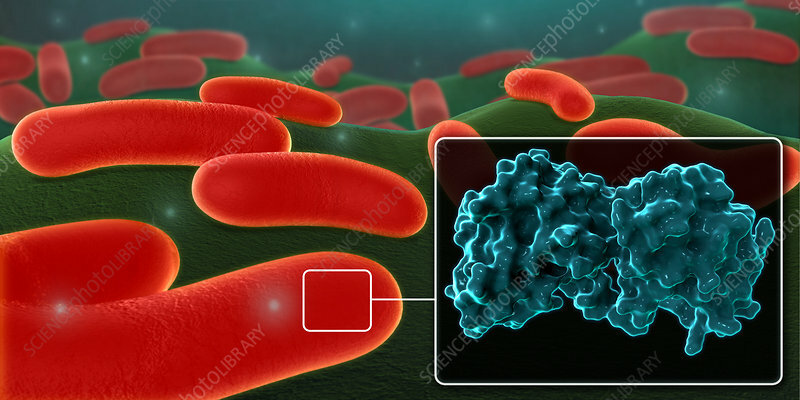 Bacteria that produce carbapenemases become very difficult to treat, and have been detected in strains of Escherichia coli (E. coli) and Klebsiella pneumoniae. Though strains of bacteria with the NDM-1 gene can be deadly, patients who are at risk are mostly those being treated for other conditions or who are prescribed long courses of antibiotics.